Mont-St-Michel, the famous mount off the coast of Normandy, is named after the St. Michael because he was said to have miraculously appeared there in 708, an event which was subsequently celebrated in the Christian calendar on 29 September. The great physical similarity between Mont-St-Michel and St. Michael's Mount, and another apparition of St. Michael there, led to the Cornish site being 'twinned' with the Norman one. This manuscript, recounting the Norman apparition, was produced as a gift to the Cornish site. 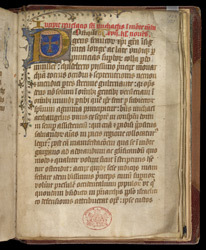 The start of the text is marked by an initial containing the arms of the archpresbytery of St. Michael's Mount.